Many thanks to everyone who joined us for the tour, including representatives from Ho-Chunk, Inc. and other solar enthusiasts from Ho-Chunk Village, Lyons, Sioux City, South Sioux City, Blair, Tekamah, Lincoln, Omaha, and Boston, among other places. Special thanks to our tour host, Robert Byrnes, owner of Nebraska Renewable Energy Systems and The Winnebago Tribe’s Sustainability Director. For many years Robert has been on the front lines of policy development within Nebraska. 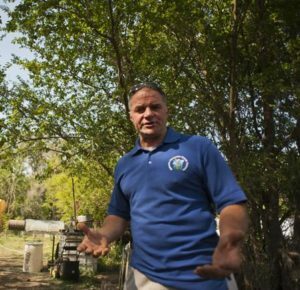 He lives on a small off-grid farm in Lyons, where he raises beef, poultry and pork. Robert is an organic chemist by education and an industrial chemist by trade. His work in that field resulted in the first and largest commercial biodiesel plant in eastern Nebraska. His current focus is on opportunities in solar and wind energy development in our state. Top Photo Credit: David Corbin, Nebraskans for Solar Board Member. (Some attendees not in the photo were still visiting with one another and others had left to start the tour). Our significant progress in 2017 works toward larger goals of Tribal self-sufficiency and good stewardship of the environment. In 2017 Ho-Chunk, Inc. and the Winnebago Tribe made an investment of over $700,000 in renewable energy with the support of U.S. Department of Energy grants. The tribe received one of only 13 national awards from DOE. $374,654 in matching grants from Tribal sources, including Ho-Chunk, Inc.
Ho-Chunk, Inc. has worked with Nebraska Renewable Energy Systems for these multiple projects in 2017. 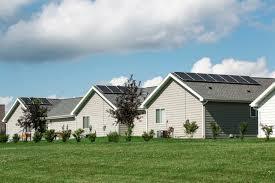 1,000 solar panels installed at 14 sites across the Winnebago Community. These include: Pony Express, Veterans Park, Ho-Chunk, Inc. Headquarters, and the Senior Center. These projects will offset 25% to 75% of total energy usage at these sites. From Omaha, 77N or 75N through Winnebago and turn left into parking lot for Pony Express/Titan Motors on the north side of town. Solar Farm is on north side of commercial spaces. This entry was posted in Nebraska / Midwest News, Solar Energy Education and tagged economic benefits of solar and wind energy deployment, Ho Chunk Village, KCAU, Lance Morgan - President and CEO of Ho-Chunk Incorporated, Robert Byrnes - Owner of Nebraska Renewable Energy Systems and The Winnebago Tribe's Sustainability Director, Sam Burrish - Ho-Chunk Inc's Communications Manager, tribal economic development leadership on August 12, 2018 by Helen Deffenbacher.